Conversations With Taj: Yes. Sometimes. Finally, I feel like I lived into some answers. When I’m having a conversation with Taj, sometimes I doubt what I am hearing. On the one hand, I doubt it if she says something I don’t want to hear, like all the times she has pinned her ears and stomped her feet in response to me putting a saddle on her back. Was she just over-reacting? Testing me? Responding out of habit and not realizing riding wasn’t going to be so painful any more? Maybe her nasty-faced-teeth-gnashing doesn’t really mean “no…?” I’ve come up with plenty of reasons why what looked like “No. That makes me angry and miserable. Leave me alone,” might not mean what I thought it meant. On the other hand, I may doubt if she says something I do want to hear, like all the times when I’ve climbed aboard while she’s grazing and she stands calmly and contented. Or when she has followed me right up to the saddle on the fence without a moment’s hesitation nor the bat of an ear. Then, I figure, it must be a fluke. She must be distracted. She’s testing me. I must have missed something. These conversations with Taj have been an intensive foray into the intersection of intuition and confidence. There’s no manual on how to talk to a horse, so intuition plays a huge role in interpreting body language and movements. 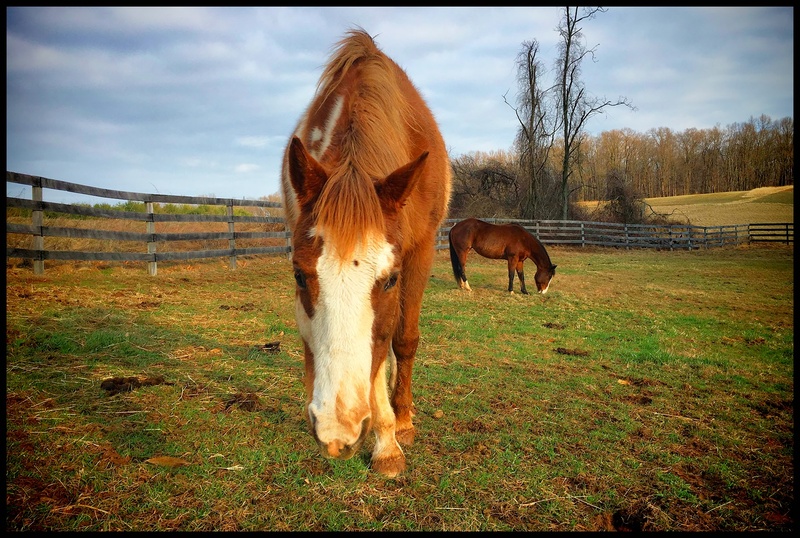 And confidence, well, without feeling confidence about what my intuition was telling me, I wound up flip-flopping and wishy-washy in my end of the conversation, which no horse (nor human) can tolerate for long. Best to just walk away from those waffling conversations, is what the horse determines time and again. On this particular day, I decided to take her trail riding. We have been on plenty of walks through the woods together, both of us on foot, so I know she enjoys being out on the trails. I also know that she enjoys being in the company of Daisy and Zorro, and today, I had two friends coming to ride with me. And as I reviewed everything we’d been doing to prepare to make this an acceptable, if not enjoyable experience, I had to shake my head and almost laugh at the prospect of even wondering if I’d done enough. I have spent hours being with her, patiently hanging out and watching the world around us while she does whatever it is she wants to do… usually that is grazing, but sometimes dozing or dreaming, and I even brought myself to relax around her while she was cribbing. All this was an effort to join her in her world, and spend time with her on her terms. It is a way to build the friendship. As Elsa Sinclair puts forth in Freedom Based Training, it is one way of “putting money in the bank” of the relationship. I have increased the amount of equine guided work she’s doing – work I know she enjoys. 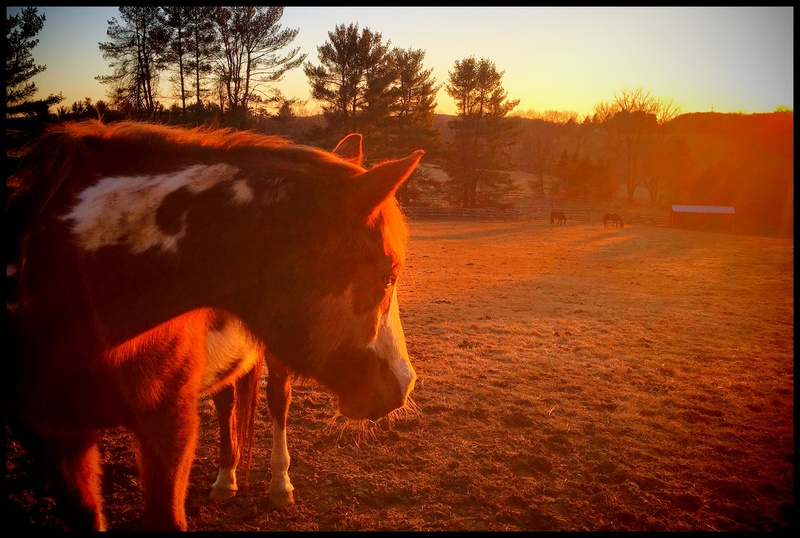 Even when it has been dastardly cold and horrible outside, I created an online group for people to at least be able to send life inquiries I can ask of the horses. Taj has been an eager participant whether it is a group of people coming in person or me filming a session of myself asking for insight on someone’s behalf. One thing is for sure: Taj likes to give her opinion. I have slowly re-introduced saddling and mounting as if she was learning the process for the first time at age twenty-three. I have checked and rechecked for any physical pain issues that might be exacerbated by riding. And finally, I went digging through her past, finding and speaking to almost all of her former trainers and owners. What this brought me was, more than anything, affirmation of what I suspected about her behavior being a result of past experiences and some “emotional baggage.” What it also brought me was the only saddle she’s ever had that actually fit her well. 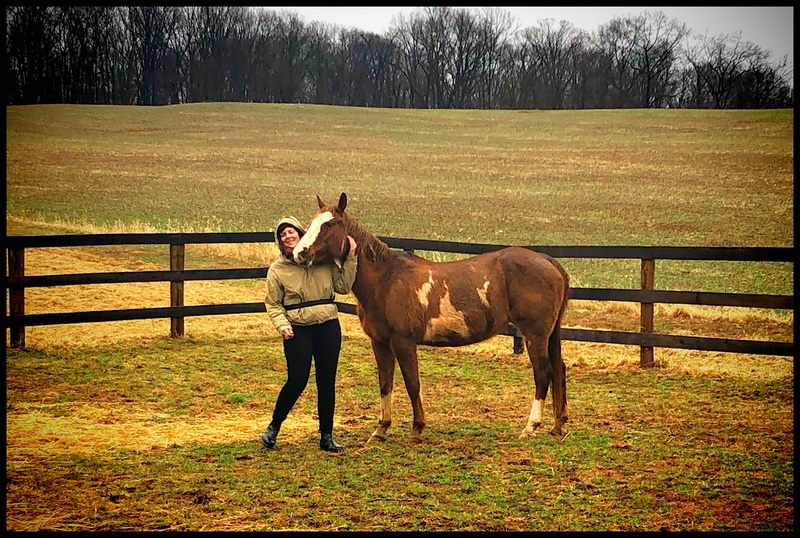 Ten years ago, when she broke her leg and was given away, the saddle didn’t stay with her, and it was a key element in her ever having been able to relax and accept saddling and mounting. I happened to speak to the former owner who had that saddle… I got in touch with her in January… two days after she had sold the saddle. Fate would have it that the saddle didn’t fit for the person who bought it, so I was able to contact her and buy it back for Taj. 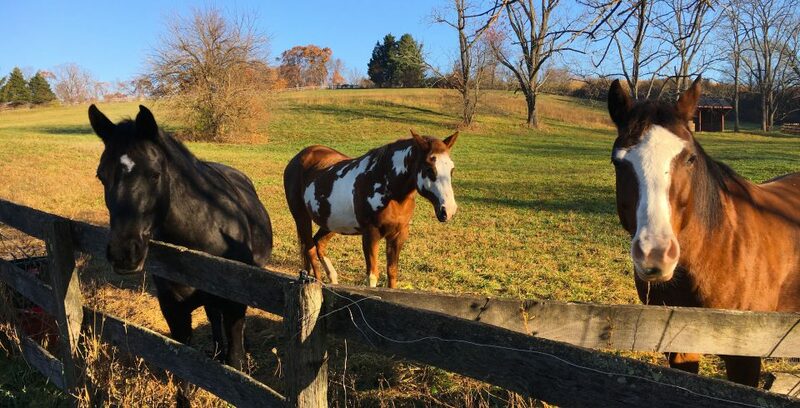 Therefore, on this day, I would be asking her to ride on a trail she enjoyed, in the company of her “herd mates,” and with her very own, comfortable saddle. I felt confident that I was setting her up to have a good experience. She stood quietly at the tie ring by the barn, waiting peacefully while we started with the other horses first. When the saddle went onto her back, she gave only a half-hearted ear pin, and then went back to dozing in the afternoon sun. By the time I was buckling up the girth, she was so relaxed I might as well have been performing a world class equine massage. There was a second, half-hearted ear pin at the mounting block, but any shadow of discontent faded away as soon as we were ambling up the lane. We trekked through familiar, clear paths, and paths littered with limbs that were new to her. We listened to the birds, ecstatic that the winter wind storm was over, and breathed the scent of wet pine. We traveled up steep hills and across level fields, feeling relaxed yet vibrantly alert and ready for whatever would be next. Taj was quite happy to follow or to lead, and in fact, as we headed into the last stand of woods towards home, she resisted… she actually seemed to be saying she wanted to stay out longer. It was a simple day and I only really had one thing on my to do list. I didn’t care if I failed to return nine emails and two phone calls, never showered and ate crackers for dinner. I entered the ride promising Taj and myself that if she was truly averse to it or uncomfortable, I would turn back, even if I was just at the mounting block. 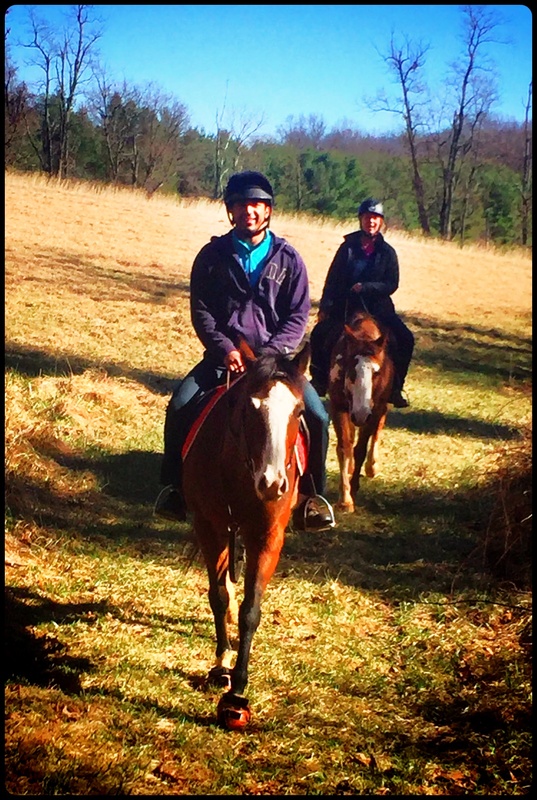 All I had on the to do list this day was to enjoy the ride, both my horse and myself. I didn’t tell her what to do, and I didn’t just ask her either. There is a middle ground. There is a confident invitation. There is a contagious “let’s go!” that is generated when we feel confident about ourselves, our intuitions and our goals, and I believe that’s what she responded to today. I don’t have the expectation that every try will be this enjoyable, or that she’s transformed into an ears-forward, enthusiastic horse who is mostly loving life. I’m pretty sure I don’t even live up to that standard. But can Taj enjoy more in life and in riding?